Here are some products and systems Marc noticed at the show, that give a good idea of where the industry is headed. The AV word of the last five or so years, “collaboration” is still evolving and growing. When we were designing systems for our clients “back in the day” we used to describe it in the sense that “all this gear and great stuff” would allow for everyone to conduct meetings more effectively. I think the biggest trend I’ve seen in the last decade, is the move to consolidated, integrated systems. Multi-function devices that are most importantly small in size and incorporate the most important elements of connectivity, function and fidelity. Much of what we at SM&W design for our clients is on large global, mission critical or enterprise projects. Although these environments may be more sophisticated and incorporate larger switching, multi-display mapping and imaging there are still many program requirements for breakout spaces, huddle and collaboration spaces both within these projects and with facilities that may only incorporate an MPR and or combination of smaller meeting places. 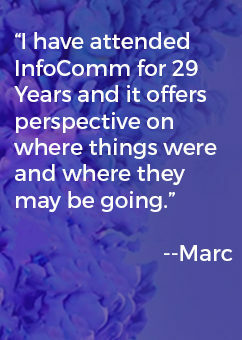 Infocomm has always been about cool stuff and new platforms. I’ll leave the observations on large format LCD walls & UC connectivity to my esteemed colleagues. Where previously I got my own geek excitement going for the biggest and coolest I now smile broadly when I see new products and the continued development toward performance in small packages that do so much and are intuitive to operate. • The new Crestron “all in one” Mercury conference and control table top. It sounds great and the screen GUI I saw worked fast with no perceived function-to-function latency. • Being an audio nut first & foremost, I love what Shure has created and their continued focus on microphones and conferencing solutions such and the MX900 and the P300 intellimix platform. • PRYSM’s products and the Prysm Go cloud based digital workplace platform reminds us all of the benefits of multi-modality, ubiquitous connectivity for remote meetings and collaboration. At Infocomm 2017 I saw more acoustical measurement applications, acoustical treatments and materials finding their way to the show floor and also educational & seminar tracks at the show presented on the importance of proper acoustical planning. “Laser Video Projectors” are now the size of a standard projector and readily available. The first Laser Projectors I worked with on projects in the UK in the early 90’s required separate water cooling devices that were the size of a yard shed. Amazing. 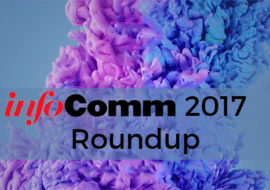 Infocomm is more than just the products & technology on display or the opportunities for continuing education. It’s also very much about the people, the cultures and companies that make up this industry. With our firm, the early morning pre-show breakfast meetings were an essential means of connecting with SM&W colleagues from all over the world. Grateful for that and for the commitment of SM&W to have 20 staff members attend the show. It’s valuable to us as professionals and most importantly to our clients. Uniquely, it’s also a privilege to be part of the NSCA Education Foundation and participating in their fund-raising efforts. Now going on 14 years, the efforts of the Drunk Unkles band of industry musicians on behalf of the NSCA is quite meaningful and personally rewarding. Funds raised at the annual concert events go to support AV trade education scholarships and also to offer programs to universities and municipalities about essential Mass Notification UC platforms & planning. Infocomm is important. Our clients, AV educators, integrators, service providers, manufacturers & other consultants were all there. One of the images that I felt was so representative about the importance of attending was seeing the owner of a NY based AV contractor at the convention hall as the show opened at 8:30am on its final day. Having been completely consumed with client work in NY for the first two days of the show he had taken a 5am flight to Orlando to catch the shortened last day and see the show at warp-speed. The important thing was that he did just that. 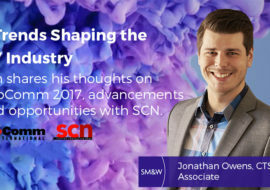 He made it and attended Infocomm 2017.